It is unanimously agreed that the use of colours in movies is an aspect that is now taken for granted; but it has been a real achievement, as far as cinematography is concerned. Right from the moment it was possible to use colours in films, it has become a fundamental element. Additionally, songs are of equal importance in Bollywood, and have been characterized more than once by bizarre themes. Themes that are often inspired by vibrant colours. Today, BollyCurry brings to you a series of songs that drew inspiration from various colours. A song can be remixed as many times as possible, but the original remains undeterred. "Gulabi Ankhein Jo Dekhi" was composed by the legendary R. D. Burman and sung by Mohammed Rafi. The movie stars Rajesh Khanna and Nanda in lead roles. Pink expresses gentleness, tenderness, sweetness and innocence. "Gora Rang Pe" from Roti is directed by Manmohan Desai and showcases the calming colour, white. Said song is sung by Kishore Kumar and Lata Mangeshkar, whilst the movie features Rajesh Khanna and Mumtaz romancing together in a rainy scenario. Black is the colour of darkness and mystery. But it also gives tenacity and determination in pursuing goals, and that aspect is used in portraying the character of Vijay Malhotra in Baazigar. "Yeh Kaali Kaali Aankhen" features the Shah Rukh Khan - Kajol jodi in an energetic and tuneful song sung by Kumar Sanu and Anu Malik, with lyrics by Dev Kolhi. Green is a colour traditionally associated with nature and, in general, relaxing sensations. "Joote Dedo Paise Lelo", sung by Lata Mangeshkar and S. P. Balasubramaniam, is the perfect cover for the exchange between the bride's sister and groom's brother. 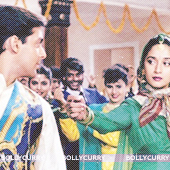 Starring Madhuri Dixit Nene and Salman Khan in lead roles, the movie was an instant blockbuster. The song features Salman Khan, Akshay Kumar and Priyanka Chopra. The lyrics were penned by Arun Bhairav, while the music has been composed by the musical duo, Sajid - Wajid. In this song, the red hue evokes love and passion, which is the reaction to beauty and elegance. "Dil Dooba Neeli Ankhoon Mein" features Akshay Kumar, who falls for the blue-green eyed beauty, Aishwarya Rai Bachchan. He uses this colour, via song and dance, to capture her heart. With lyrics by Sameer and music by Ram Sampath, Sonu Nigam and Shreya Ghoshal completes the song with their powerful vocals. Blue truly describes the beating of the heart. Orange is associated with light and is used to symbolize joyful moods. 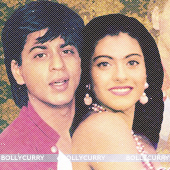 This song focuses on one of the most romantic onscreen couple of tinsel town, Shah Rukh Khan and Kajol. "Gerua" is a quintessential romantic song with music by Pritam and lyrics by Amitabh Bhattacharya, while Arijit Singh and Antara Mitra lent their voices. Of course, the list is endless and the aforementioned songs are just a few of the lot. The blue of the sky is poetically mentioned in the "Neele Gagan Ke Taale" from Hamraaz (1967) and "Neela Aasmaan" from Silsila (1981). There are also songs that are just so colourful, such as "Saat Rang Ke Sapne" from Saat Rang Ke Sapne (1998) and "Des Rangila" from Fanaa (2006). Most recently, Badshah's "Kala Chasma" from Baar Baar Dekho (2016) has made it to the playlists of millions. Colours are called the smiles of nature and they still continue to pass messages in their vibrant language of silence. When we add words to the effervescent hues and acknowledge the beauty of something, that message becomes beautiful. With this, we pass the baton over to you, readers. We're sure we have missed some important tracks that featured a colour. Don't be shy, go ahead and share your favourite colourful song! Graphics: Nidhi D. and Rifah K.
CUTENESS: Riteish- Genelia's little Son Riaan has set a GREAT EXAMPLE All is well between Sajid Nadiadwala and Tiger Shroff!